It’s officially Fall, which means it’s the perfect time for pumpkin bread. Featuring a simple combination of buckwheat flour and pumpkin puree, what I love about this bread is how easily it comes together–> it’s practically fool proof! There are no egg-substitutes to worry about, and if you line your loaf pan with parchment paper, you don’t have to worry about the final result sticking to your pan, either. 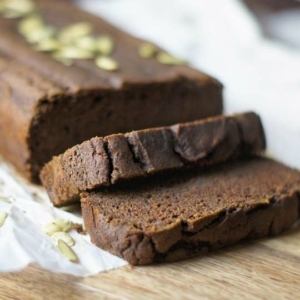 This seasonal bread makes a delicious morning treat when served with tea or coffee, or a nice afternoon pick-me-up on a chilly afternoon. As an added bonus, your kitchen will be filled with the scent of Fall spices for the rest of the day! 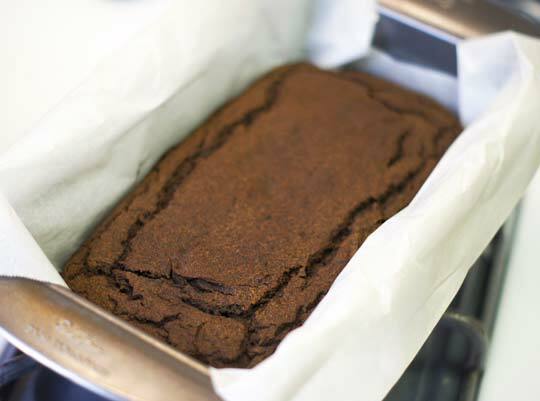 Preheat your oven to 350F and line a standard loaf pan with parchment paper. (Not to be confused with wax paper!) In a medium mixing bowl, whisk together the buckwheat flour, cinnamon, ginger, cloves and baking soda, then stir in the pumpkin puree, melted coconut oil, maple syrup, vanilla and water. Finally, add in the apple cider vinegar, which will help the loaf rise when it reacts with the baking soda! I used Bob’s Red Mill Buckwheat Flour to develop this recipe, so that is the brand I recommend using for best results. Homemade buckwheat flour tends to bake differently, for some reason, so keep that in mind when making substitutions. Using other types of flours will also drastically affect the results, and are therefore not recommended. If you don’t have apple cider vinegar on hand, lemon juice or another type of vinegar should work, as well. Reader Feedback: What’s your favorite flavor of quick bread? I have always loved zucchini and pumpkin flavors! Great recipe!! I’ve made it twice and I feel mine could use a pinch of salt or something. It may be the brand of buckwheat flour I’m using. Next time I’ll try Bob’s. Hi – Just made this using quinoa flour rather than buckwheat, and it is wonderful. Also substituted coconut nectar for the maple syrup (the nectar is a little sweeter). Thank you! Hmmm… I made this exactly according to recipe and my loaf never baked through. The flavor is wonderful though! Any tips to get a more bread-like good? Thank you! I am so happy I found your website! This bread is wowza!! The only change I made was to cut back on the syrup by 1 tablespoon (I like everything a little less sweet). My toddler and I scarfed up two pieces long before it was cooled. 🙂 Thank you for such a fantastic recipe!! This recipe is amazing. I made a double batch and brought the bread into work and everyone loved it and wanted the recipe, even though none of them are Gluten Free or Vegan (I am in the military) so that says a lot. Three days later and the bread is still moist and full of flavor, which is a rare find with Gluten Free Recipes. I will definitely be trying more of your creations. Thank you so much, from a very excited and content Gluten Free Vegan 🙂 P.S. I tried to give you 5 stars but it will only let me give you 3 for some reason. I am allergic to buckwheat flour, did anyone have luck using rice flour? I want to make this for a party this week and am looking for some eassurance that it will come out ok. Any feedback would be very helpful, thanks! Jenn try quinoa flour. I just did and it worked fine. Yum! Just made this and sampling now. I didnt have any buckwheat flour on hand but I did have teff flour. The substitution was perfect! I cooked it a full 60 minutes, added 1/4 tsp real salt, and about 1/3 cup enjoy life chocolate chips. I can tell I’m going to have to use A LOT of self control to not eat the whole loaf by myself! Thank you! I just made this, it is delicious and the best part is VERY easy to make! I love that it is gluten free, dairy free and sugar free! Thanks!! Made this today and it was really good, but not quite sweet enough for my taste. It was my first time working with buckwheat flour, so just getting used to the taste. Once I drizzled a tiny bit of maple syrup over it, it was AMAZING!!! I love the texture. Thanks for another fantastic recipe Megan! Did anyone who made this feel like the buckwheat flavor was very strong? or did the pumpkin mask it well? I’m not a huge fan of the buckwheat flavor…thanks! I love the texture but not the taste. The buckwheat was really overpowering. I couldn’t really taste the pumpkin or maple syrup even. Just spiced buckwheat. I was going to ask the same thing about the strong flavor of buckwheat. Even though I like it (and make my own cereal with toasted buckwheat), I have made gluten free breads with buckwheat flour and just did not like the taste. Another commenter made the recipe with chickpea flour…I wonder if using half chickpea and half buckwheat flours would be a good compromise? Has anyone tried that? Hi Megan! I am a long time lurker and first time poster at your site. Thank very much for this recipe. I’ve made it 3x times since you posted it. 3x! The first time I followed the recipe exactly. The second time I added some walnuts and cocoa nibs. The third time I substituted prune purée for the maple syrup, added walnuts again, some finely chopped candied ginger, and 3 teaspoons of chia spice mix. Yummy. This is very simple and versatile recipe. Thank you. But more importantly – congratulations on your new family member. All the best. Do you have any idea about numbers of servings or calories in this? Looks amazing!!! I also wanted to say that the fact that theses were made without eggs and sweetened with maple syrup is AWESOME! I don’t eat eggs or most kinds of sugar so this recipe was SO nice! I made this yesterday and loved it!! Thank you! Please, please, please create more recipes like this! I can’t eat grains and I am allergic to almonds so recipes made with buckwheat flour are AWESOME!! I will be extremely grateful if you create more recipes using only buckwheat flour! Thank you! I LOVE your site! It’s amazing! I made this today with honey because that’s what I had on hand. It really is great, and makes your kitchen smell amazing. One thing I would add is some salt… I put in a 1/4 teaspoon and felt it boosted it just that extra amount! My husband just made this with half buckwheat half chickpea flour. No other substitutions. It is so amazing, we are all glad he made a double batch. Wow! This looks so good! Thanks for posting. I look forward to all things pumpkin in the Fall. * Lori-it’s worth the $5 for parchment paper! So much easier to get out of the pan, and clean up. I used about twice the spice-I always do. I skimped on the honey (I always try to reduce the sweetner in my baking), and regretted it-I like it, but I ended up putting apple sauce and some stevia on top and eating it like a pudding. Still yum! And would make again with a little tweaking. I made this yesterday and it was a major hit. It was delicious. Moist, sweet without being too sweet, and it was just perfect. And my mom, who is not a big fan of pumpkin, loves it as well. So that’s saying something. Thank you so much for sharing this. Would it be ok to oil the pan instead of the parchment paper. I don’t have parchment paper and don’t want to buy some just for one recipe. 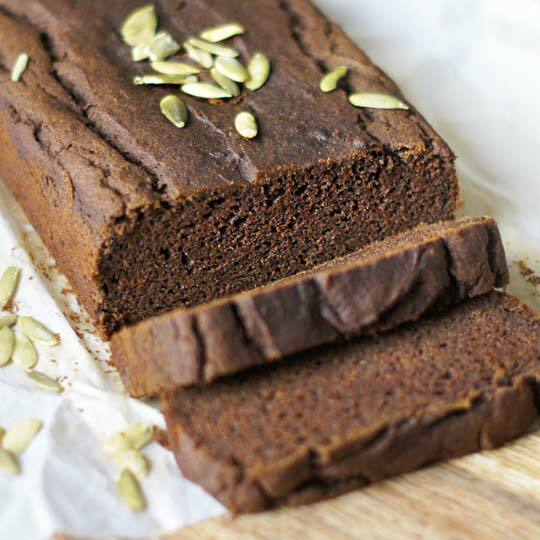 Is it possible to substitute spelt flour for the buckwheat? And if so, how would the recipe change? THanks, so glad i found your website. Made this right away this morning and just finished a warm slice with a cup of coffee. I only had brown rice flour on hand so i used that but no other substitutions. It is absolutely delicious! 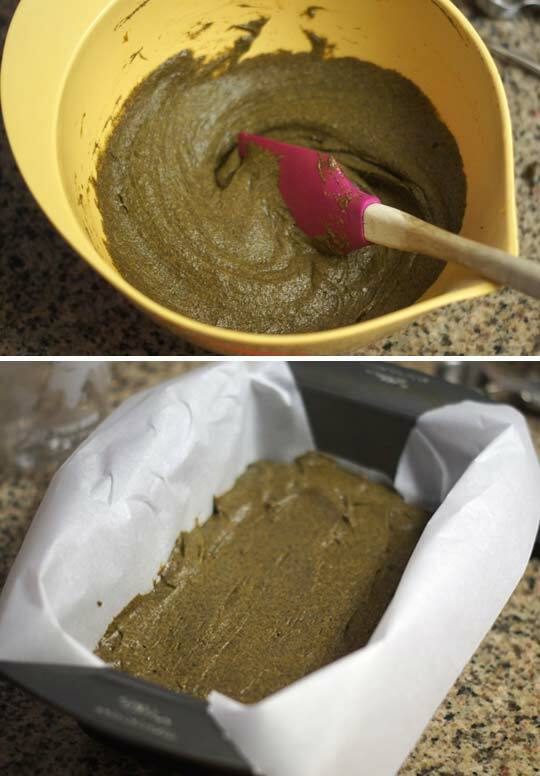 It was incredibly easy to throw together and has a wonderful, moist dense cake like texture. Let the leaves fall im ready! This was yum yummy! Made it today and it’s half gone. This comes out like a dense bread, which is awesome, and it’s not crumbly like a lot of grain free breads. Thanks Megan! The only ingredient I didn’t have on hand was maple syrup, so I used honey instead. If I was going to make any other changes, I would add a little salt to enhance the flavour. Yum – perfect or fall. Thnaks for the recipe. Hope you and your baby are doing wonderfully! Hi, I’ve used chickpea flour to make pumpkin bread and muffins before (sometimes I combine it and have also used it on it’s own). I really enjoy chickpea flour, even though I sometimes hear others say they don’t like it due to a “beany’ flavor. I’ve never really noticed much of a beany flavor, even in something sweeter like pumpkin bread. I’ve been using a chickpea flour from an Indian store but it’s pretty much the same as Bob’s Red Mill. I actually want to try Megan’s recipe with half buckwheat and and half chickpea flour. Another nice thing is that the color works well with pumpkin. Sorry for the delayed reply but I just wanted to come back and say thanks for the information and that I did make this bread with chickpea flour and it worked out wonderfully! It’s so good! For those concerned about the “flour” term or gluten (lack thereof), here is an excerpt from: http://www.wheat-free.org/wheat-free-flour.html However, if you read package ingredients, sometimes there will be a little note underneath that says “manufactured in a facility that also uses tree nuts, soy, wheat, and milk.” So if you’re super-sensitive, it’s best to read the fine print! “Buckwheat flour is not, despite its name a form of wheat, buckwheat is actually related to rhubarb. The small seeds of the plant are ground to make flour. I was under the impression that all flour has gluten in it. My sister has Crohns Disease and she cannot have any type of flour at all! Is there something special about Buckwheat Flour that it is considered Guten Free??? I’m sensitive to gluten so I’ve done a lot of research on it lately. Gluten is a protein that’s found in wheat, barley and rye, so I can eat flour made of corn, coconut, millet, rice, quinoa, and other grains. For gluten-sensitive and many Celiac sufferers there are a lot of grain options out there. I’m not sure about Crohns. It could be that your sister has to avoid other flours for an alternate reason besides gluten. But if it’s just gluten that she’s avoiding she *should* be able to have those other flours. And like it says above, buck”wheat” isn’t from the same family as wheat so it’s gluten-free. It’s actually a seed, not a grain. According to Dr. Osborne all grains have gluten. I have Celiac disease and although got better when I went off wheat barley and rye, still did not recover fully. So out with the so called” gluten free” flour subs. Some worse than others but they all have their own gluten protien. They may not be “gluten” proteins, as in wheat-barley-rye, but there are many proteins that are ‘cross-reactive’ meaning they cause a very similar response as gluten proteins. All grain proteins can cause digestion problems, for some people, and can be linked to problematic autoimmune responses throughout the body. Nut and seed flour proteins might not cross-react, but this recipe was formulated with Bob’s Red Mill buckwheat, so any alternative flour would have to be tried and adjusted as needed to get the right consistency. As a side note – read the small print on the labels very carefully with Bob’s Red Mill products, because same say they could have traces of wheat, soy, and tree nuts. Soy contains an allergen protein that will cross-react and cause digestion problems, for some people. Just wondering if you have any suggestions for a flour substitute? I haven’t used buckwheat before. I am more familiar with almond flour, would it work in this recipe? Thanks Megan! Thank you for sharing this! It looks delicious! Thank you, also, for always including your helpful notes, substitution options & links to show the specific products/ingredients you recommend! This looks incredible. And I’m happy this is vegan as well! I’m so excited to start whipping out the pumpkin treats this season. I googled substitutions because I just don’t have any buckwheat at home and I’m excited for the season of pumpkin flavored everything! I think almond flour or “nut meal” would work because they would both be a heavier consistency. I’m also going to try using butternut squash puree rather than pumpkin, because I have one on the counter. It’s cooking now so we’ll see! Thank you for the recipe. My first fall baked good! Could you suggest a grain-free option? I know buckwheat isn’t really a grain, but I’m super sensitive and a little wary of trying it. Thanks! I don’t think you have to worry about buckwheat. It’s not a grain, and I don’t know of any gluten-free people who have issues with it. Hello Megan – I was hoping you would post a pumpkin bread recipe. What can I substitue for the coconut oil? I have used organic olive oil or grapeseed oil to sub for the coconut oil in other recipes. They worked fine. I can’t wait to try this recipe!